The place to come for all things VW Camper related! Camper Mart will have a range of free talks, demonstrations and workshops on topics from VW conversion tips and techniques to experiences of touring the world in a camper. 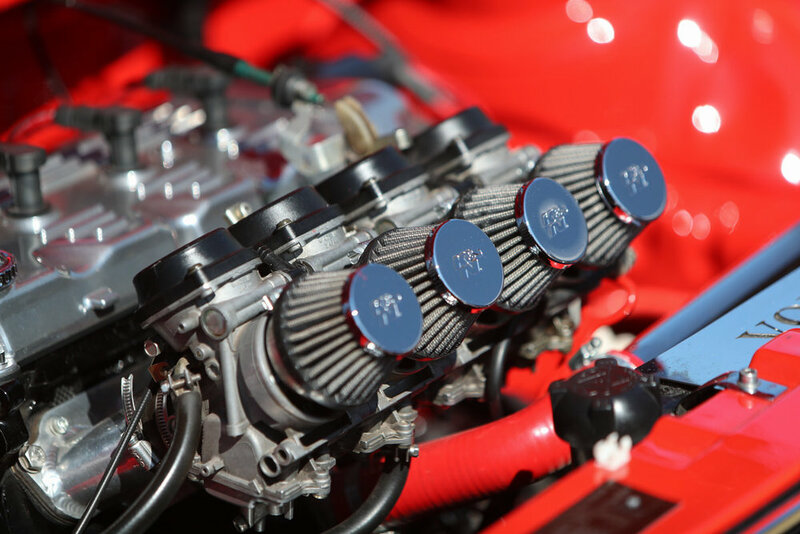 Ron Evans of Evans Autopoint in Kettering will be on hand to answer all your questions and queries on the maintenance and repair of the modern Transporter’s engine. He is also something of a suspension and lowering guru. Ron has been working in the vehicle repair industry for over twenty -six years and is well known in the Kettering area for his honest approach and excellent service. Ron knows about VWs at his garage, Evans Autopoint offers a full range of services including repair, service, MOT, diagnostics and even full camper conversions. BeLow at Evans Autopoint, is the Transporter side of his business, they offer a full service for Transporter owners, specialising in suspension work. 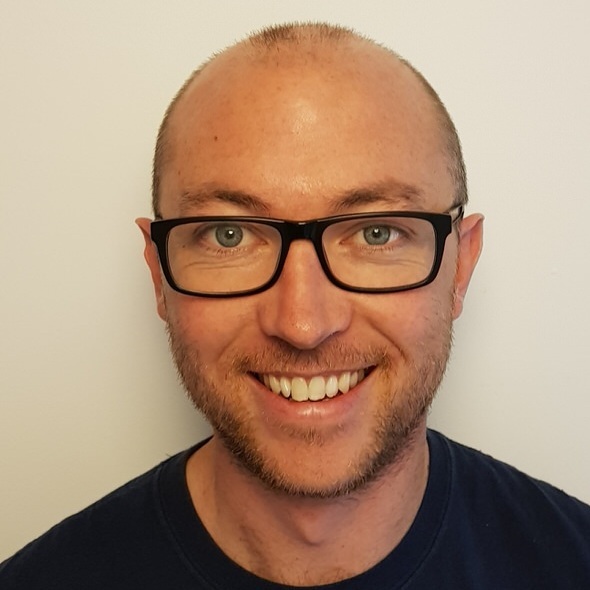 Jonny Ashworth the man behind Slidepods will be present to unveil an exciting new product at the show, I’m afraid we can’t tell you anymore as it’s top secret, sorry. Come along and find out what it is. 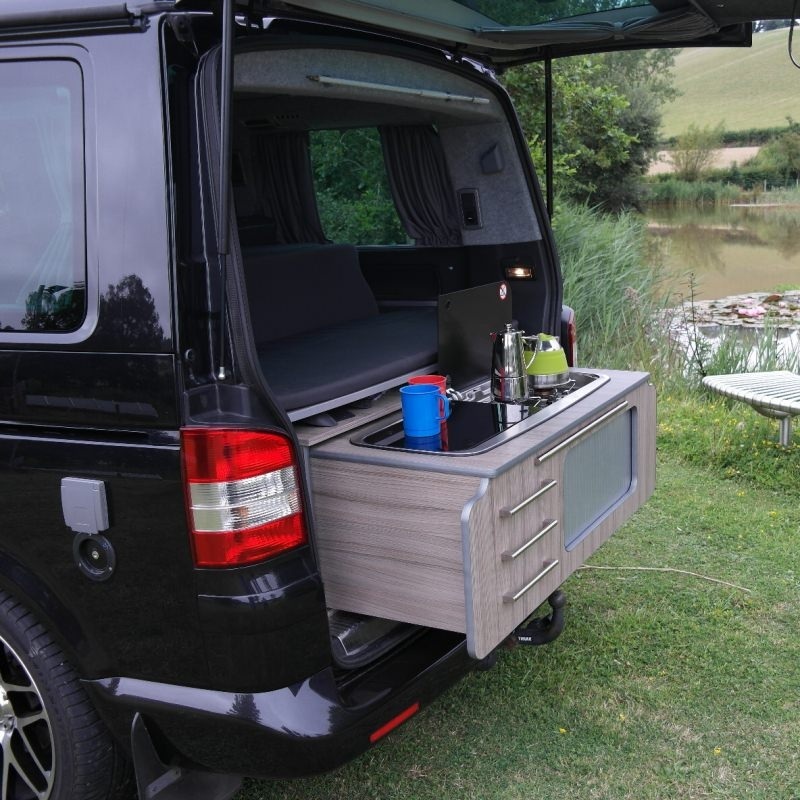 Slidepods design, build and install those innovative kitchen pods in VW T5/T6 Transporter variants of all kinds, with both standardised and custom options available. Slidepods also offer a full conversion service including: Pop top roof fitting, sound insulation and ply/carpet lining, electrical installs, Webasto diesel night heater installs, etc, etc. They have become market leaders and are a watchword for clever design coupled with high quality. Robin Fearn and Darren Bond will be on hand to answer all your questions on maintenance and restoration of air-cooled buses. Robin has been involved in the VW scene for some 30 years, having owned many VWs from an early age (his first car was a red Baja bug!). Rob set out to find a job working on his passion. Rob has worked on most models of Split Screen buses and Bays, later specialising in the T3, T4 and T5 transporters. Rob owns Busmeister a restoration & repair business. With a wealth of experience and knowledge gained over the years, he can offer you the technical advice on most aspects of owning a VW bus. Darren Bond has been into VWs for most of his life and has owned a variety of Split and Bay models. He has fully restored many models from pick-ups to campers over the years and has always worked on and maintained his own buses, and in the process has carried out just about every job there is. Editor of Camper & Commercial magazine, will be giving a presentation about travelling overland in a Split Camper to India and back in 1976. Travelling 30,000 miles through Turkey, Iran and Afghanistan to Kashmir, he recalls encounters with bandits, tackling a sand blocked carb in the desert, terrible "roads" and places and sights that can no longer be got to, or which no longer exist, due to religious fanaticism and wars. His anecdotes are all illustrated by an incredible selection of photographs capturing the varied cultures and scenery during this epic journey. Stephen Enright, the brains behind Peak Campervan Training is a time served coachbuilder with over fifteen years teaching experience at Sheffield College behind him. 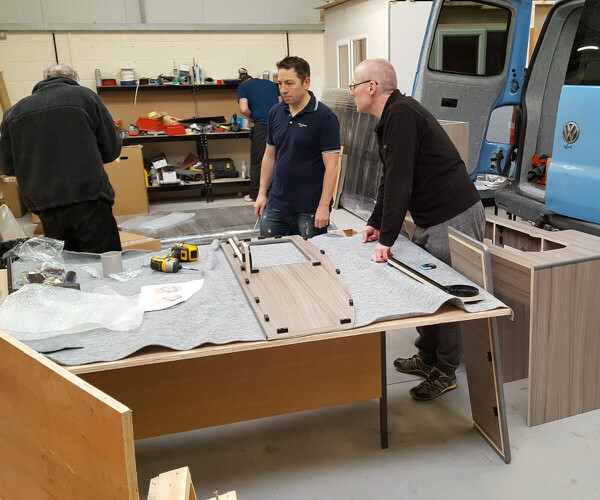 It’s not Stephens intention to train his students to be qualified electricians or cabinet makers, but he can impart sufficient knowledge to ensure that they can go on to confidently tackle a camper conversion of their own. He will be at the show to demonstrate carpet lining and to answer any of your conversion questions. Jonny Ashworth discusses how he set up his innovative company from scratch and how it became a market leader in the VW world. As voted by the readers of VW Bus magazine, the Bus Of The Year 2018 award will be presented on stage. Sam Gibbs and Jacqui Lawson run the training company, Upholstery Courses UK, there’s no need to guess their speciality. In the last twelve months the company has expanded and they now offer course all across the country. 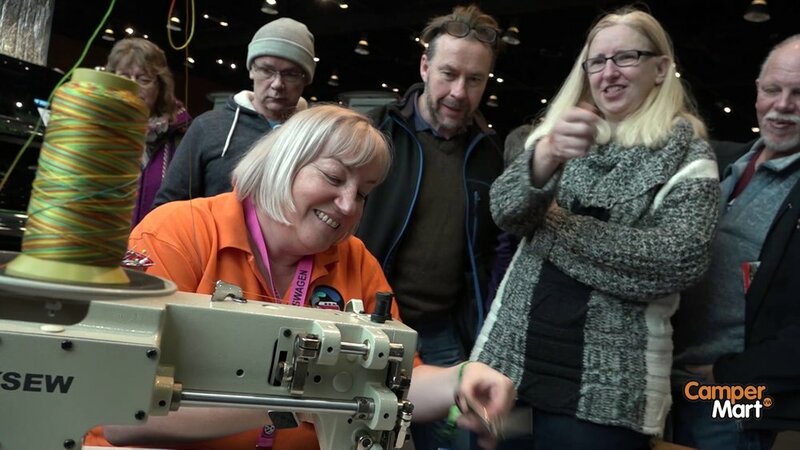 Back this year by popular request, Sam and Jacqui will be on hand to offer advice as well as demonstrating their skills behind the industrial sewing machine and giving show goers the opportunity to try their hand too. If you were on the car scene in the 90s you will definitely have seen some of Russell Venvil's work. Russell was the main designer for the company responsible for all those hugely popular car caricatures, Kool Art. That was then, nowadays he heads up his own business, Venvil Design. Recently, he decided to break out the marker pens once more. He now offers personalised caricature commissions of your pride and joy. All his work is hand, not digitally drawn on A3 paper. Come and meet the man himself at Camper Mart where he will be carrying out a commission live at the show. You can see more of Russell’s work by searching for Venvill Design on Facebook or @Rudeylolo on Instagram. Founded by Cartoonist Peter Jones, his creative background is derived from his love of motor vehicles, graffiti & cartoons dating back to his early teenage years. In 1996 Peter decided to fuse these three artistic styles together to create his signature drawing technique. 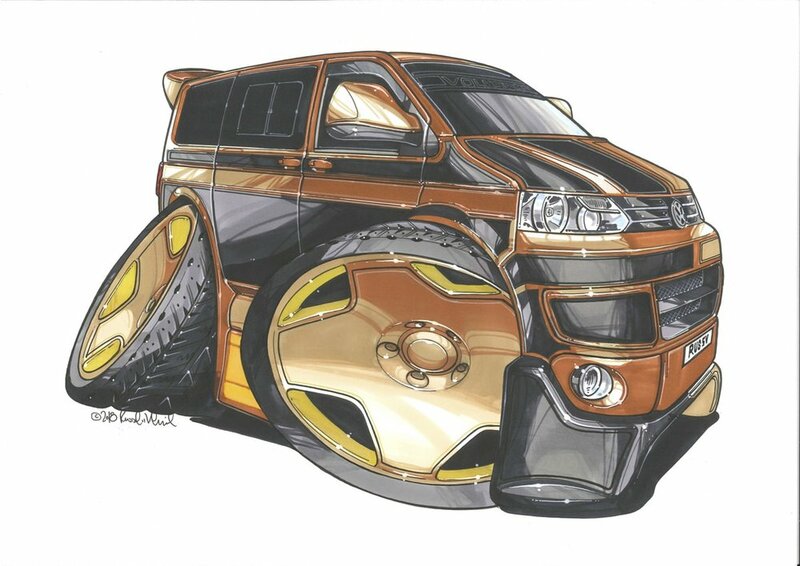 Peter passion for customising motor vehicles and love for travelling has led him into the Volkswagen Campers scene. He currently travels across the country his unique Split Screen camper, accompanied by Spike his surfboarding dog. 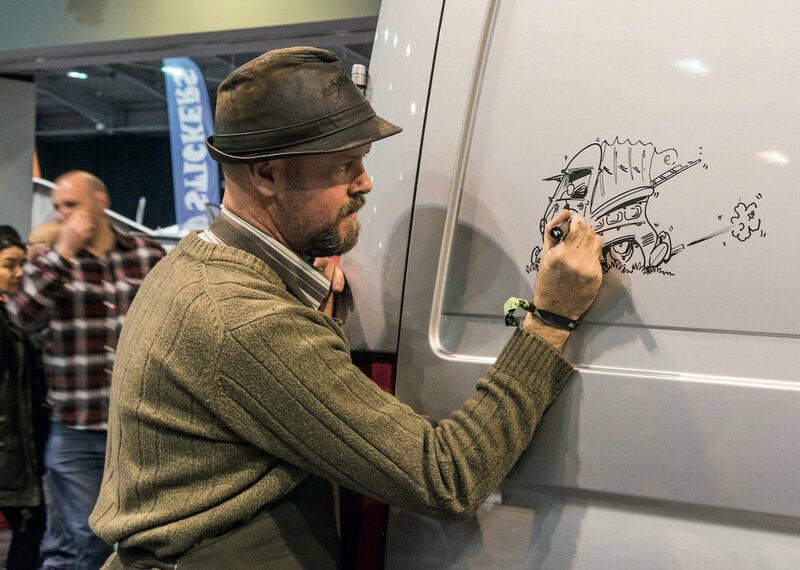 Peter is a regular face at many of the UK’s Volkswagen shows – where you will see him drawing personalised cartoons of customers vehicles directly onto the glass and panels of their vehicles. At Camper Mart, Peter will be doing an exclusive design on the Jazz Events VW Crafter, ready for us to take to all our summer shows! VDub Radio will be broadcasting live from the show throughout the day. 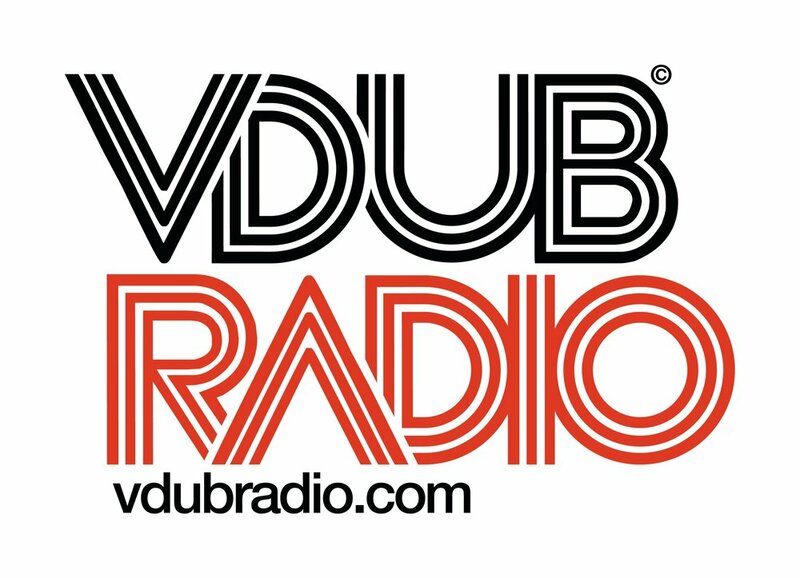 VDub Radio is a brand new internet radio station that plans to be at the heart of the Volkswagen community. Launched January 2019, VDubRadio has had an overwhelming response from the VW community. The station plays music 24 hours a day, 7 days a week with specialists DJ shows scheduled in the evenings. It’s owners, Tony Barnett and Simon Connolly from SE London are avid VW enthusiasts and have both DJ’d and worked on radio for over twenty years each. They are also music producers and have tracks published on iTunes and Spotify under their band name Love To Funk. The idea behind VDub Radio was to combine their passion for music and their love for the VW Scene. © 2018 Jazz Events Limited. Registered in England, No. 6724942.